Attention, middle and high school science teachers! 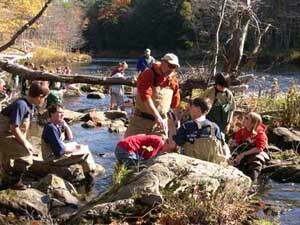 New Hampshire Fish and Game has an exciting and free Watershed Education Program (WEP) that will put your students where the action is in their own watershed. Students will become Citizen Scientists, studying and working with local community partners to improve and maintain healthy aquatic ecosystems for fish and wildlife. The program has a three phase format that can be implemented separately or as a total package. The program is aligned with Next Generation Science Standards (NGSS) and current NH science curriculum standards and frameworks, allows students to use the latest technology, and helps accomplish the goals of the fisheries division and the Wildlife Action Plan (WAP). Students visit their local water body to collect water samples to measure Dissolved oxygen, pH, Temperature, Turbidity, and Conductivity. They also collect and classify benthic macroinvertebrates. They use these chemical and biological parameters to define the water quality of their testing sites. Take a look at the NHF&G WEP Watershed Water Quality and Fish Map. On the map, select the water drop icons for water quality data and select the fish icons for fisheries data. As an extension of studying the river, students can raise trout eggs in the classroom (Trout in the Classroom program) or study the behavior of fish with a warm water fish tank (Simulating a NH River Ecosystem program). Electrofishing: Students get to become fisheries biologists for a day to study the aquatic resources of a river onsite by helping "electrofish." 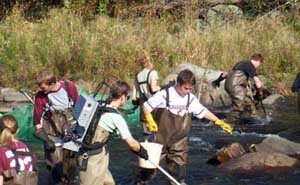 New Hampshire Fish and Game staff will allow the students to experience fish sampling techniques, to perform a habitat assessment, and to collect, identify, and measure freshwater fish species. To sign up for the Watershed Education Program at your school, contact Watershed Education Specialist Judy Tumosa at judy.l.tumosa@wildlife.nh.gov or call (603) 271-0456. Teachers who complete the required training will receive a NHF&G Department Watershed Education Program Teacher Manual. 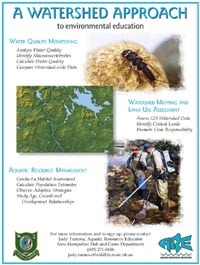 The Watershed Ecology Institute has been updated to provide a more direct link to Geographic Information System (ArcGIS) and its use in aquatic studies of rivers, ponds, wetlands and marine aquatic ecosystems. Educators learn how to collect, map, analyze and share water quality and fisheries data sets from the NH Fish and Game Department and other schools. . They will go back to school with access to free ArcGIS software and aquatic study tutorials to use in their classrooms. Instruction will be provided by various university and agency specialists and teachers themselves! Graduate credits will be offered from Keene State College. For more information about the institute and registration details, please contact Watershed Education Specialist Judy Tumosa at judy.l.tumosa@wildlife.nh.gov. New Hampshire Fish and Game's Aquatic Resources Education (ARE) program consists of two main parts that teach aquatic ecology, aquatic resources management, and angler education to various audiences. The Watershed Education program targets middle and high school teachers, while the Let's Go Fishing program provides full-length courses and shorter clinics to public audiences and also reaches schools (grades 5-12).